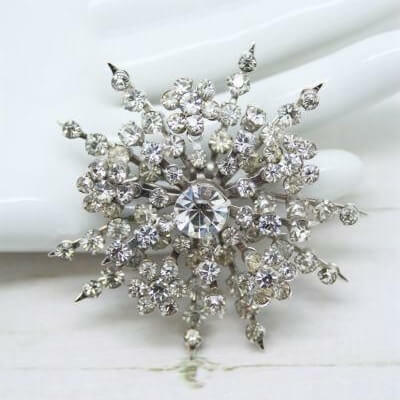 Description: This beautiful late 1940s early 1950s fully signed Coro brooch has a delicate and pretty design, featuring claw set chaton rhinestones in a silver tone setting. 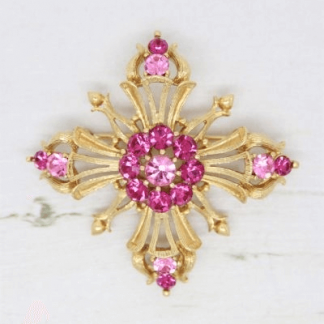 The layered design of the brooch depicts a floral star with a larger centre stone. Despite its delicate style the brooch is very strong and robust, complete to the back with strong roll lock clasp. Measuring approximately 5.5cm at widest point. The brooch is in good condition showing slight wear only – As can be seen a few rhinestones have slightly yellowed with age. The setting of the brooch remains bright and clean. 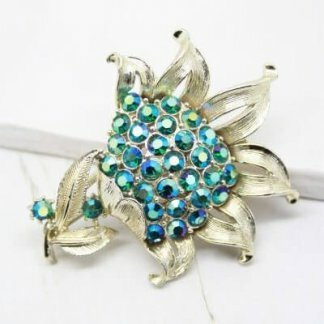 Still a beautiful brooch for everyday wearing that will be admired when worn. Weddng Tip: Prefect for “Something Old”.